Cremation has become a much more popular final disposition method in recent years, though the method has been around for centuries. Studies show that about half of those in need of the final service for a family member choose a cremation. There are a number of reasons for that including costs, versatility, and acceptability. While cremation is popular, there are different types of cremation to consider. Direct cremation, or cremation only with no service, is the simplest and most affordable option for many. Final service costs can vary based on what you choose for your loved one. Traditional funeral services are known for being quite costly. They can cost as much as $15,000, according to Budget Direct. In Australia, funerals generally start in the $4,000 range and upward. There are products and services included with traditional burials that are not necessary for a cremation. For example, you do not need a casket, a burial plot, or a headstone. While there may be personal reasons why such items are necessary, all items cost money. Direct cremation offers minimal services and is the most affordable. An unattended cremation entitles you to a basic cremation service for your loved one without any other services. Since this service has fewer features, direct cremation is less costly than traditional burial services as well as alternative cremation options that have additional services. Families can have no service cremation in Melbourne performed for as little as $1,695. A direct cremation package price is all inclusive of all associated fees. If you are considering a direct cremation for a loved one, you will want to know what it involves and includes. First, the service provider will pick your loved one up at their place of death, whether that is the hospital, a nursing home, a family home, or another location. They will then transport your loved one carefully to the facility that will provide the cremation. These professionals can also help you complete and file the legal documents that are required before the cremation takes place. You will have to have an official death certificate created as well as the authorisation for the cremation. The direct cremation provider will then care for your loved one until the cremation takes place. After your loved one’s remains are cremated, they will be respectfully place the ashes into an urn. You are welcome to choose a decorative urn or a cremation urn in a certain material, but the provider can also issue one to you. That option is up to your family and your decision might depend on what you are planning to do with your loved one’s remains later. The facility will then return the cremated remains to you in their container, or one of your choosing. These services are all included in the cremation only with no services package charges. While there are many benefits that come along with cremation in general, there are specific benefits with the direct cremation option. Before deciding on cremation, or this specific type of cremation, it is a good idea to consider the options and benefits that you could have with family and friends. Cost is a major benefit of a no service cremation in Melbourne. While a cremation is always the less expensive option, having a funeral service before cremation takes place, for example, will increase the costs quite a bit. Direct cremation takes all of those unexpected costs out and allows families to focus on one low price. Having direct cremation performed for your loved one does not mean family members ca not have a memorial service or ask for a specific scattering process later. You can perform the memorial at your family home, in a park, or somewhere private that does not add to the expenses. Since there isn’t a visitation involved with the process, there is no need to embalm the person’s body before the cremation occurs. Direct cremation occurs soon after death without any other services beforehand. There doesn’t have to be extensive body preparation performed, which not only helps to cut down the costs but also allows family members to remember their loved one in their prime. Since there isn’t a funeral service held before the direct cremation takes place, there certainly doesn’t have to be a casket purchased. Some families rent caskets to hold services prior to cremation, but with an unattended cremation, there doesn’t have to be a casket at all. That cuts back on the costs and allows families to focus on planning an intimate memorial service instead of choosing something physical. There are many things that revolve around convenience today and final disposition services need to be simple. However, there’s nothing wrong with choosing cremation because of flexibility and convenience purposes. Despite what others might say to you, do what you feel is best for your loved one. With direct cremation, you can have whatever services you want later. There are no limits on the type of memorial service you can have, where you can have it, and what the timeline will be. You don’t have to rush through the planning process to beat a deadline. You can take your time with things to ensure everything is as you want it. You can also have the service wherever you like. You can easily transport your loved one’s remains in your own vehicle to another location. Or, you can put the service off for a month or longer to allow family the time to arrange time-off from school, university or work and travel to your place. 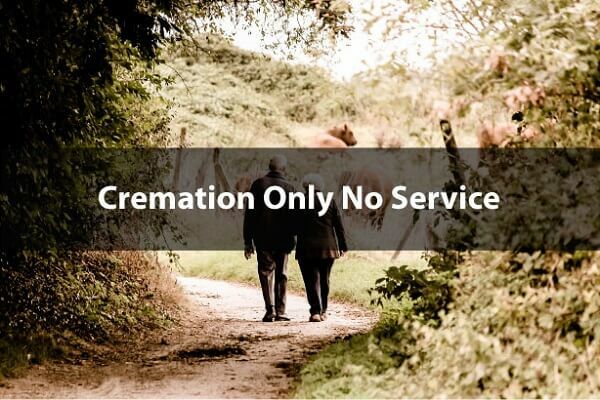 These options are available when you choose the cremation only with no services package. If you have never organized a final service for a loved one before, you might not know the rules. These rules are in place to protect and benefit you. You have the right to select only the services and products you want in relation to your loved one’s final services. You don’t have to purchase a casket, if you choose not to. You don’t have to embalm your loved one unless that is a part of your plans. Final service providers are also required to be fully transparent about the prices they offer and the services they provide. You don’t have to worry about a bunch of fees being tacked onto your bill later because they need to be upfront about what they charge and what you get for that cost. You can receive detailed statements of the services provided and the price charged so there are no queries. Knowing that these rules are in place can make you feel better about an unattended cremation or any other type of cremation you choose for a loved one. The Metropolitan Cemeteries Board can help you with further questions you might have in this area. When the time comes to decide on a final disposition method for a family member and you find yourself in charge, it can be hard to come to a conclusion. Here are a few reasons your family might be better suited for no service cremation in Melbourne. One reason more people choose cremation only with no additional services is because of budget concerns. You might feel awkward about choosing direct cremation just because you can’t afford something else. However, there’s no reason to feel guilty. Keep in mind that direct cremation is a perfectly respectful way to honor a loved one. You can share your memories of them and show your love in a number of ways after the cremation. When family members are scattered across Australia, it can be hard for some people to drop everything and travel to one location for a funeral service. With unattended cremation, the disposition method can take place right away and family can celebrate a life well lived whenever it suits everyone. There can be a memorial service sometime in the future or individual families can each have their own service in their own location. Not everyone in your family is going to tell you what they want for the final services. If you know they want a cremation, deciding for direct cremation can be very easy. But even if you aren’t sure, you know your loved one well. If they weren’t the type of person who liked to be the center of attention and they wouldn’t want a big fuss made over them, direct cremation is a good way to give them a semblance of privacy and respect, even after their death. Decisions have to happen relatively quickly after someone passes on. If you’re going to have a traditional burial, you have to start the planning process right away. If you aren’t sure what kind of service you want to have, going with direct cremation takes the pressure off your shoulders. You can take your time planning a memorial service later, if you decide to do so, but there are no timelines you need to meet. If you need time to grieve and allow yourself to soak in your new lifestyle without your loved one with you, unattended cremation is a great fit to help with your appeasement. If you already know you’d like to be cremated when you pass on and direct cremation sounds like the best option, you can organize your own final services in advance. There’s nothing wrong with contacting a provider and setting things up for yourself. When your time comes, even years down the road, your family doesn’t have to wonder what you wanted or how to go about getting the correct services. Make your wishes known and put everything into writing so family members know where to go when it’s time for your plan to be put into action. Making any choices for a loved one who has passed on without leaving instructions behind can be very trying. If you want to look into unattended cremation to see how simple it is, contact the professionals at Fixed Price Cremations by calling 1300 262 797. Our compassionate representatives are here to talk to you about the simple, no service cremation in Melbourne. We can answer your questions, talk to you about benefits, and offer our help with compassion. Dealing with the loss of a loved one is never going to be easy, but having experts on your side to get you through the final disposition can relieve you of at least some of the burdens you face. In this time sensitive manner, take as much stress out of the situation as you can by adding peace with Fixed Price Cremations. How Much Does it Cost to be Cremated in Australia?